Wow. I know it's a bold statement to make, but I think Mortal Kombat might be the most fun fighting game ever made. Well, offline, anyway. Now, I'm sure fighting game purists could say that my bold statement is also a foolish one because Mortal Kombat isn't as deep or technical as [insert fighting game here], but that's precisely what works for it. It's immediately accessible in a way that not even Street Fighter has been able to nail despite two decades of "quarter-circle forward, punch" being burned into our brains. Inputs are simple, fast, and easy to string together, so you don't need to a be a pro to feel like one. It's incredibly refreshing. That doesn't mean that Mortal Kombat lacks depth, though. It borrows the familiar super meter mechanic from Street Fighter IV, but swaps Supers and Ultras with X-Ray attacks that look awesome and are smartly effortless to pull off. And hey, if you really want to hop into the training mode and work out long combos and mess with damage percentiles, by all means, go ahead; it's super satisfying to finally nail that ridiculous combo you've been working on and bring it into a real match. That depth is there if you want it; you just get out of it what you put in. The game treats both casual and high-level play with equal respect, and is all the better for it. So, when we're talking about sitting on the couch with friends and lots of trash talking, Mortal Kombat is phenomenal. On the flip side, the online multiplayer experience is one of the worst I've ever had. If you're lucky enough to connect to a match, prepare for an unplayable, unresponsive mess. Lag pervades every aspect of the experience, even the character select screen. The developers keep promising some magical patch to fix everything, but it's already over two months too late for me. As far as I'm concerned, Mortal Kombat doesn't even have online play. 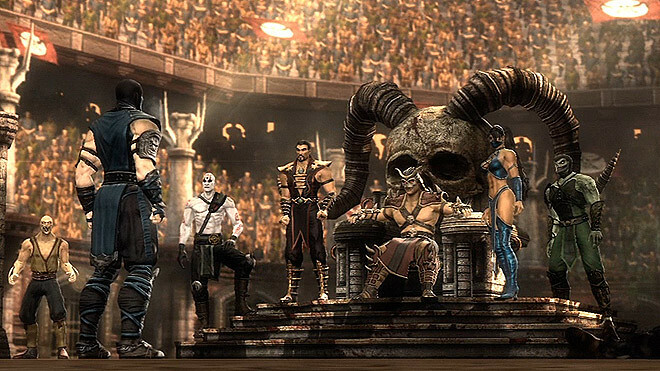 Even though it completely drops the ball for online multiplayer, Mortal Kombat makes all other fighting games look incredibly lazy when it comes to the single-player side of things. First, the game totally reinvents how to present a fighting game's story in such a logical way that it's baffling to think it took this long for someone to do it right. It plays out like a movie most of the time, until a fight naturally breaks out, then the camera just spins around to the familiar perspective and the announcer says, "Round 1. FIGHT!" The story being told isn't exactly high art, but the way it's presented is nothing short of a revelation for the genre. All future fighting games need to follow suit. Next, the sheer amount of content is staggering. That story mode will take you around eight hours to finish and is entertaining enough, but there's also the classic arcade tower for every character, the introduction of tag team battles, a ridiculous amount of bonus unlockables, and the Challenge Tower that has 300 creative, increasingly difficult challenges for you to work through. Personally, I got burned out after about 50 of them, but I'm still glad it's there. Regardless, I've never seen a fighting game with this much content. 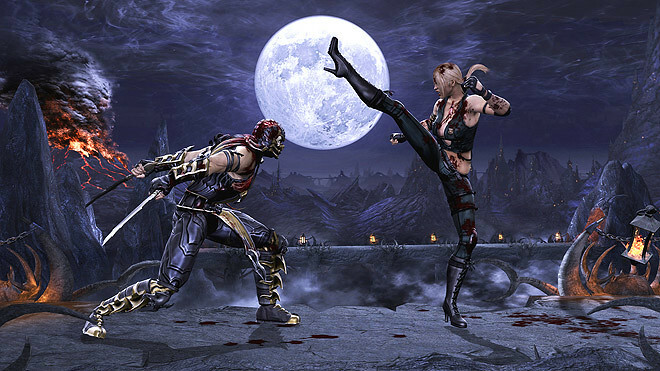 What I love most about Mortal Kombat, though, is just how much heart it has. Everything in it comes across as a labor of love for the developers, from all the inside jokes and references to its long legacy, to the imagination in the Fatalities, to crazy modes like Test Your Luck that lets you end up with matches where you might have no arms, or the screen is upside-down, or you have no arms. The game recognizes and embraces how absurd it all really is, something I wish more games could do these days. I fell in love with Mortal Kombat when I started playing it, then out of love with it, hard, when I tried to play online. As an offline experience, it can't be matched, completely worth every dollar and every hour. But online? What a missed opportunity. I might even extend the praise to "best fighter I've played" if the online weren't such a travesty. That said, I've dumped in the ballpark of sixty hours into this game's offline features, which are relatively few--but it speaks to the game's depth and general gratification.